In Singapore Art Museum at what was called the The Korean Contemporary Show, this exhibition reflects development of Korean contemporary painting over the last five decades as seen through the works of 12 artists. From the 1950s, Korean has witnessed enormous economic and cultural changes that artists have responded to with a diverse angle of approaches as they dealt with issues of tradition and modernism. For this reason, there are two major ideological tendencies have emerged, one trying to be above tradition and the other trying to rediscover it. But both of movements have a common interest, it can be understand in the context of the cultural identity. This exhibition can be classified three sections; after Korean war, from 1970 to 1980 and after late 20th century. The first section focused on the Korean Modernism painting in the 1950s and introduces three artists who are Tschang Yeul Kim, U-fan Lee and Seo-bo Park. These three artists are regarded as key artists that have helped move Korean art into Modernity. After the Korean War (1950-1953), most of Korean artists started to seek for new forms of expression while considering on the traces of the war. Just after the Korean war, the social problem of poverty was a source of creation for many artists, for instance Seo-bo Park who was one of leading forces behind the Korean Informel movement, he said that “everything had gone back to ashes, all conventional values and ideas were laid naked and bare. I had to raise questions”. Reflecting on art historical point of view, in 1957 is a symbolic year as starting point of contemporary art what was called the Korean Imormel Movement. It was a first major abstract art movement in Korea, it often used rough brushstroke and mixed media on large canvas with loud colors in an abstract art style. At that time many Korean artists sought to adopt this abstract principle and also include Korean traditional iconography in their works, it could be called an experimental style. The second section of this show presents works of artists who became distinguished in the late 1970s to 1980s. This generation of Korean artists who began to combine things of daily necessity into their works in a more figurative style than former artists. Kang-yong Kim who is the well-known as the brick artist because he depicts bricks for building in various ways of permutations and combinations. He takes sand and grains as the materials of his painting it is reflection on industrialization of Korean society. But sometimes this motif is arranged in a grid-like format, conveying the beauty of order; in orders, they tumble toward the viewers, conveying turbulence. The third section focuses on after 1990s until now, we might be say contemporary art which has largely been a reaction to the 1970s and 1980s, showing a spacious relate with the social function of art. The contemporary art goes beyond visual aesthetics and pushing the boundaries of the medium, rather their art reflects their social problems for the individual as well as the tensions the exist within society. We think about Tae-kyu Yim’s work Marginal-Man on the relations between social circumstances and individual concerns, he has constantly visits theme, called the marginal man, can be said to have matured through gradual developments. Very first Marginal-Man involves a picture plane of a face of what he observed in what others see in such a person as a marginal-man, presenting his main concerns about the marginal-man. These portraits are devoid of any individual uniqueness; they are simply faces of people. Using red and brown colours for the portraits, he conveys men living in the complicated modern world who do not know who they are and lack identity. Through these faces, short of any embellishment and movement, Tae-kyu Yim had reached closer to the answers to his concerns. 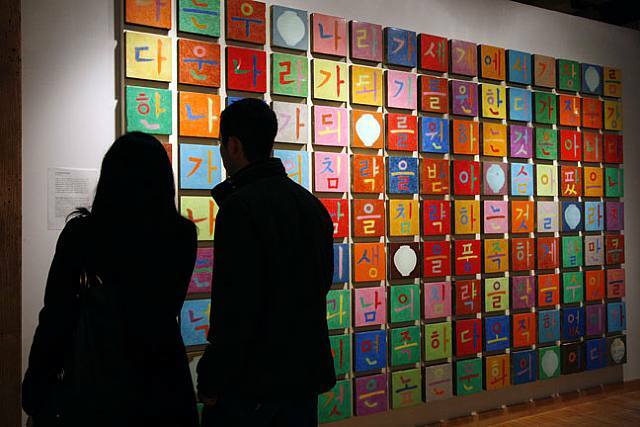 As an other example, Ik-joong Kang is primarily known for wooden board mosaic installation works made up of 3 x 3 inches of squares representing various aspects of his life. His work Happy World consists of hundreds of icons and symbols hand painted on small ceramic tiles. He described himself as a collector of the hopes and dreams of peoples he meets, finally he translates other peoples mind through colors and shapes as artistic tools onto miniature canvases. Posted by Yun In Kim	on Saturday, February 14, 2009 at 14:50.